Indian Navy Invited Application from eligible candidates to apply Online Through the official website for the post of Fireman. This is a big opportunity for 10th pass candidates who are looking for Government jobs in India. 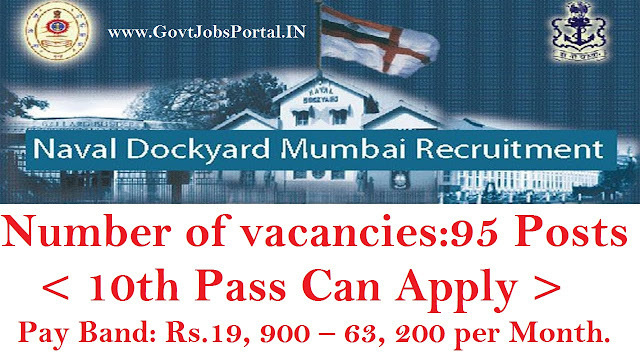 Naval Dockyard Mumbai is going to heir fresher candidates all over India. There are total 95 vacant posts of Firemen Grade-1 and Grade-2, which are going to be filling up through this Naval Dockyard Recruitment process 2018. More information related to this 10th pass Govt jobs in India is given below. Read the whole article carefully before proceeding for online application form. Pay Band: Rs.19, 900 – 63, 200 per Month. Qualification Required: Indian candidates who have passed in their 10th class examination from a well recognized education board can apply for this Naval Dockyard recruitment 2018. Age Bond: The minimum age for applying these 10th Pass Govt jobs is 18 Years and the upper age limit is 25 years. So the candidates who fall in between these age criteria can apply. What is the Application Fee for applying these Jobs? Naval Dockyard recruitment department said that there is no need to pay anything for applying these 10th pass Govt jobs in India. So all Indian can apply for these Government jobs without paying any application fee. What is the Process to Apply for this Naval Dockyard Recruitment? The process for applying these Government jobs in India is to apply online with the Naval Dockyard official website. We also mentioned the official website link below in our IMPORTANT LINK section. The process for applying online will be start on 30tgh April 2018 and will End on 19th May 2018. All the candidates have to apply online in between these dates. 30th April 2018 is the Starting Date to apply. 19th May 2018 is the Last Date to Apply.